Remember this photo from "Ziggy Milk, Ziggy Butter, Ziggy Mozz"? 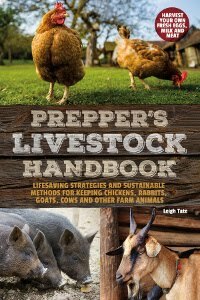 Farmer Barb (Life Rock Farm) and Brenda (A Separate Path), were interested in how I make my butter, so in this post I'll show you my method. I'll also share everything I've learned about the process, both through research and experience. First, a little about raw goats' milk. You may have read that cream cannot be obtained from goats milk because it is naturally homogenized. Is that true? In my experience, no, this is not true. Cream does indeed rise on goats' milk and can be skimmed. Why then, do folks (even goat owners) sometimes say it's naturally homogenized? There may be several reasons. The fat globules in goats' milk are smaller than those in cows' milk. This is one of the reasons why goats' milk is more easily digested than cows' milk. (This has nothing to do with lactose intolerance, which is the inability to digest lactose, a milk sugar). Being smaller, the fat globules are slower to rise, but also, those in goats' milk apparently do not cling together as readily as the fat globules in cows milk. I find it has to sit in the fridge for several days to really get enough to skim. Those who use their goats milk within 24 hours, likely won't see a cream line, which may contribute to the idea of natural homogenization. Regarding freshness, depending on cleanliness and how quickly it's cooled, raw milk will stay fresh for longer than you'd think, like a couple of weeks. This brings up another point about raw milk, it doesn't actually spoil, it sours. When pasteurized milk goes bad, it putrefies. Anyone who has sniffed a jug of old store bought milk knows what I mean. Raw milk on the other hand, will smell sour. Many an old time recipe calls for sour milk and saleratus (baking soda) to leaven baked goods. The reaction of an acid (sour milk), combined with a base (baking soda), creates carbon dioxide bubbles, which cause the batter to rise. On the one occasion I had milk that soured, I saved it for baking. Soured, it keeps for months and makes absolutely heavenly chocolate cake. It can also be fed to chickens and pigs. Another reason for the idea of natural homogenization, may be the breed of the goat. Some breeds produce more butterfat than others. Individuals may vary, but in general, Nigerian Dwarfs and Kinders produce the highest amounts of butterfat, 6 - 7% plus. Nubians come in next, with 4 - 5%, followed by LaManchas with 4+%. Most other breeds produce less than 4%. Butterfat is what gives richness to the milk, plus rises to the top as cream. Lower butterfat will mean less, and perhaps negligible cream. I have small goats, small amounts, and small needs. At this time in the season, I'm getting about a quart of milk per day. This is strained into wide mouth canning jars. I find the wider mouthed jars easier to skim the cream. After the milk sits in the fridge for about 3 to 5 days, I use a slotted spoon to skim off the cream. It is thick and rich. cream for whipped cream and butter, for just the two of us. I skim all my milk except what I'm saving to make hard cheese. Last year I learned that skim milk cheese in nowhere near as tasty as whole milk cheese. Mozzarella, on the other hand, is fine with my skimmed milk. Hand skimming doesn't get every drop, but that's okay. I get enough for what I need, and it leaves some for richer milk, yogurt, and mozzarella. If I wanted all the cream or had more milk to deal with, I'd likely consider a cream separator. These can be purchased in either electric or manual models, but cost hundreds of dollars. That doesn't make sense for us at this time. I put the cream into wide mouth pint jars and store in the freezer. I keep adding until the jar is full. When I need to make butter, I take one of the jars from the freezer and let it thaw on the countertop. It needs to be about room temperature to make butter most efficiently. Colder, and it takes longer. We like ours from sweet cream, but some people prefer it cultured. More info on that, here. To churn, I pour the cream into a quart jar with a tight lid. This gives plenty of room for the cream to slosh around. I just shake the jar by hand. With only a pint of cream, it doesn't take too long, the batch you see below took 6 minutes. Butter in a wide mouth quart canning jar. At one time I had a gallon size butter churn. Because I hadn't used it for years, it was given away during one of my many moves <sigh>. It would actually be too big for the amounts I make now, but I still wish I had it anyway. An alternative would be in a blender. The next step is washing the butter. Because the cream was room temperature, the butter is soft and I find working it in cold water easiest. During summer months our city tap water is not very cold, so I put a pitcher of water in the fridge to use for this step. 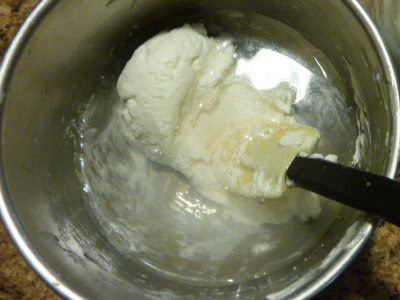 By pressing or kneading the butter with a scraper, all the buttermilk is worked out and it will keep for quite awhile. How long I couldn't say for sure because we use ours up in several weeks. Butter can be frozen, also clarified (ghee) to increase shelf life. I also saw a Butter Keeper that has me curious. Once is rinsed and drained, I work in a little salt, and pack it into an small lidded crock given to me by my grandmother. If I had butter molds, I would likely use those for table butter. 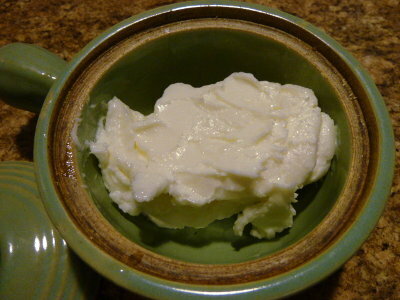 Goat butter is white, because goat milk contains no beta-carotene. It is absolutely delicious though, so I never give the color a thought. You can have a fingertip-ready copy of this information and a whole lot more in my eBook, How To Get Cream from Goats' Milk: make your own butter, whipped cream, ice cream, & more. Follow the link for a complete listing of chapters plus where to get your copy. This is probably the most concise explanation I've ever seen of the butter-making process, thank you. My Granny used marigold petals to colour her butter, she also fed them to her chickens to make the yolks more yellow. That looks yummy - I love butter - especially on warm baked goods - wish we were neighbors, I'd come knock on that beautiful new fence and ask to be invited over to tea :-) T.
Since my children are still in bed, I will refrain from running around the kitchen screaming! Yee HA!!! !That is for me! I found a mason who will be able to assemble my copious stone into a goat yard for me. I HAVE to get a milker! My daughter wants a 4-H project and I want the MILK!!! We dring way too much OPM (Other People's Milk). Thank you so much Leigh! Most people don't realize how easy making butter is :) I've also heard that letting the cream sour a bit before using, at least with cow's cream, can make a delicious butter. Not having a cow or access to cream which will sour, I've not been able to try this. I hadn't thought about freezing cream though. That's a good idea. Leigh, thanks so much for this post, it's very encouraging. It seems that with goats milk you can't go wrong. Whether it's fresh or soured, it's still beneficial is some way. My dream was for a Dexter milk cow, but I'm seriously considering beginning with a small herd of goats instead (even 2 maybe?). I'm very excited about Kinder goats (x-breed: Nubian doe and Pygmy buck)! But I may have to breed my own, since I haven't found any breeders in Ontario, Canada. Will also consider purebred Nubians or Nigerian Dwarfs. Actually, my original dream was always for goats of come kind. Hubby is the one who wanted a milk cow, but of course I would be the milkmaid, and the pooper-scooper ;-). I've never done the washing of the butter, but certainly done the rest of it many times using a 3 gallon crock churn. Ate nothing but homemade butter growing up. Leigh, the lovely white butter looks so delish wish I was there to eat a small sample on one of your home baked muffins. Jacqueline, thanks! I will have to try the marigold petals. In one of the Little House books, Laura mentions Ma using grated carrot. I tried that once but it didn't work. We don't really mind our butter white though. Barb, a goat would be a wonderful 4-H project! And you saw all the other wonderful things you can do with the milk. We had a strawberry yogurt cheesecake the other day. Yum! Nina, I wondered about letting it sour some naturally and don't know why it wouldn't work. I wonder if folks feel safer with a purchased culture. I'm not going to experiment though because we like it as is. I wouldn't be afraid to add a bit of slightly soured cream though. Jan, thanks! We love our Nigie milk, so yummy. They are a little harder to milk, at least for me because my hands aren't small. But the milk is better than our Nubian milk. Sue, I read somewhere that washing isn't done much anymore. That's just how I learned to do it, so I didn't think about it one way or another. What works is what's importnat. Debbie, how fun. I imagine that was an experience they couldn't wait to get home to tell their parents about. on one of the "pioneer" field trips that we took the kids on (homeschool group) we got to make butter by shaking it in a jar. They too let us eat it on crackers...I kinda wish we had been able to have something that let us have just the flavor of the butter, but I could do that at home as well. I have heard that selling raw milk is not legal here...but there is a way to get around it. You buy a share in the milk animal and they "give you" the milk. I don't have any friends with dairy animals and my friends with chickens live too far away. :( livestock isn't allowed where we live. I think for the quantities of milk that you are working with (both supply and demand) that your jar method is probably best. I would hate to clean out the butter churn for small amounts. A word on butterfat..... If you look up DHIR results for dairy herds who are on milk test you'll finds breeds in the top 10 for butterfat that you wouldn't expect.... Seeing some Alpines & even Saanens up there with really high butterfat numbers, I thought I'd experiment..
Great post!! Just found your blog and became a new follower (: Can't wait to come back for more...Hope you have a lovely week!! Renee, you can actually make butter from pasteurized too. I've overbeaten boughten whipping cream and gotten butter, LOL. I have heard about buying shares into dairy animals to obtain raw milk and think it sounds like a good idea for those who really want raw milk. I have to agree about cleaning the butter churn! Crystal, you absolutely have to write a blog post about this! Or have you already? This is the kind of information every goat owner would be interested in. In fact, I seem to recall reading something about diet and butterfat recently; one of the goat lists I subscribe too(?). I'm gonna have to find it and experiment myself. Stevie, I think I first read about it on Fias Co Farm website. A great way for goat owners to get enough cream for butter and whipping! Michele, hello and welcome! Thank you for your kind words. I'm on my way to visit you too. Wow! My husband was raised on goat's milk, and has always insisted that it wasn't possible to make butter from it. I was starting to get a little bummed and wishing I had a cow instead of my goats, but this has me excited again. Gosh, I can't wait til they freshen. Homemade butter is my very favorite! Thanks for such an informative post! What a great post...I learned about making butter and my mouth is watering! I believe they used pasteurized cream for the field trip butter. I looked into buying shares for raw milk and the prices are very high. You pay a one time fee for the share (which is a reasonable cost) but then they also charge a monthly fee for the care of the animal that seemed high to me...it worked out to over $10 per gallon of milk. That was for goat milk...I'm not sure that I looked at cow milk prices. It seemed that they only sold shares per animal...so you paid for the entire upkeep of just one animal. LOL, no Leigh.... Haven't blogged about it yet but it's on my "To-Do" list along with my "How-Tos" for blood drawing & disbudding. Great post! We have goats, cows, and sheep - and milk all of them. I find that making butter for each requires a slightly different method. We use a blender for small batches of cow cream butter, but this doesn't work for goat or sheep cream. I would liek to share this on our farm page on facebook, if you don't mind. Julie, how interesting. I wonder if it was the kind of goats they had, or because they used it so quickly. You should definitely experiment with this. It's fun and exciting to eat your own butter! Julene, sorry! LOL. It is a very tasty addition to anything, isn't it. Renee, goats milk is always higher than cows milk, and raw is always highest. Around here, raw goats milk sells for $6 to $8 per half-gallon. I reckon buying it a half or gallon at a time wouldn't seems as high has paying for a month's worth at at time. I'm not interested in selling goats milk, but it would be interesting to figure out exactly how much it does cost. Crystal, excellent rundown of the real cost of producing goat milk. Its true that real food is priceless and honestly I couldn't afford it. That's one of the reasons we keep our own goats! Julia, thank you and thank you for asking! I appreciate that. Please do share, I don't mind at all. I've heard of folks who milk sheep and have always wondered at it. Didn't realize there was much cream to be had there, very interesting. The cost for raw cow milk was pretty much the same. And I don't think the price is inflated...it just isn't in my budget. The one place that had goats only had 28 shares available. So during high production they're only getting 28 gallons of milk per week for milk. Fortunately raw milk sales are legal in my state, with certain restrictions regarding where it can be purchased (not grocery stores). I am thankful we can have our own goats however. Elizabeth, I've been meaning to watch that. Thanks for reminding me! Anon, you are very welcome. Thanks for commenting! Laura, welcome, and thank you for your kind words. For filtering milk, I've used both milk filters and coffee filters. Milk filters are more heavy duty, but I have to mail order them. At present I'm using coffee filters. Not sure if that's a big no-no in the dairy goat world, but it's so much easier to buy and cheaper. I have a small milk strainer, so I cut the round coffee filters into quarters to use. Because coffee filters are lighter weight than milk filters, I wouldn't use them to strain a lot of milk at a time, but for my several cupsworth they're fine. I strain immediately after milking, so have no problems with the cream. Once chilled and separated, I don't think any milk filter could handle the cream either. If you haven't already, do visit *Crystal*'s blog. "The Adventures of Noodleville.". She writes wonderfully informative goat posts. In fact, she mentions in one of them that she used to use 100% cotton t-shirts cut into pieces, to filter milk. She would bleach these after each use. I like the idea of non-disposable, but haven't tried this yet. Thefisherlady, thank you. Both for the blog visit and the comment. It's so nice to "meet" other goatherds. I know you posted this last year, but I haven't been reading your blog for very long and ran across it. When I saw the jars of cream in the freezer I had to laugh because I do the exact same thing. I even think you have yeast in there, as do I. Thank you again for sharing. I have never 'met' anyone that does so many of the same things I do. It is very refreshing. That butter croc you mentioned from Lehman's is awesome. We have one at our house, just change out the water every other day or so and your butter will stay fresh and soft enough to spread. Is it possible to make this using store bought pasteurized goats milk? Anonymous, pasteurization won't effect it, but what you need is non-homogenized milk. That's the only kind of milk that will allow the cream to rise. I've been shaking the crap out of my cream for about 15 min now and it just looks like yogurt. What am I doing wrong? I've had that happen too and it usually turns out to be temperature. "Room temperature" is supposedly about 72&deg F, but in summer mine is much warmer, so the butter makes but it's somewhat melted! I stick it in the fridge and it chills to a spreadable butter consistency. That means the whey is still in it, but it still acts and tastes like butter on bread. I know I'm quite a bit after your comment, but if you haven't already, I'd suggest sticking it in the fridge and seeing what happens. Do let me know! I did end up sticking it in the fridge and it firmed up like regular butter, not really spreadable. Come to think of it, I think mine got pretty solid too, after refrigeration (it's been awhile), but I thought it was just as good as butter separated from the buttermilk (not whey as I stated in my previous comment. Can you tell I've had cheese making on the brain?). Thanks for giving me an update. It's an interesting subject to me and there never fails to be a challenge somewhere along the way. I do think it's from the cream being too warm, so now I make butter at a warmer temp than the fridge, but cooler than air temp, and I've had better success getting sold butter and buttermilk. Becky, i would have absolutely no idea. I've never seen goat butter for sale anywhere. i would suggest going to the Local Harvest website. You can search for local food markets anywhere in the US. I'm guessing that would be your best bet. I really enjoyed your post. I think in Texas one can now get a license to sell raw milk. I was lucky enough to study under Vivian Procter, the goat show judge. I asked her how many Nubians I would need to provide butter for my family of three. She said ten Nubians or one Jersey cow. Since I was already milking 13 Alpines and Toggenburgs by hand and taking 2 hr. twice a day to do it, we got a Jersey calf and bottle-raised her. She caused so much trouble we sold her back to the dairy and bought our butter at the store. We now have an Alpine herd and one Saanen. I had one yearling Alpine that gave high fat milk and sold her to a lady who wanted to make goat's milk soap. There certainly is a great difference between individual goats in a breed. Her mom is a low to moderate milk fat producer. Did you know that raw goats milk helps cure arthritis? A doctor has also documented it as curing cancer in humans, one case in one year and one in three months. It also heals internal and external scar tissue, enabling infertile couples to have children after doctors told them pregnancy was impossible. 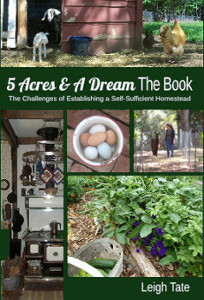 I am a research dietitian and biologist and organic gardener,farmer and rancher. Cheers! Thank you for taking time to leave such an interesting comment! That's very true about the differences in individual's milk. I did not realize that about the healing benefits of raw goats milk. I do know that when our goats had a patch of poison ivy to eat, neither Dan nor I had poison ivy reactions that year. "Scientists" argued with me about it, but seeing is believing!